First day in Paris is done and dusted and ofcourse I’ve already managed to tick off basically the main reason why I came in the first place. I came hesitatingly five years ago after my mum highly recommended I checked this place out. To say I had my doubts was an understatement. I didn’t even like falafel that much and I just didn’t understand how there could be so much hype over, essentially, a sandwich. So we decided to share one and what a mistake that was. Those preconceptions shot out the window after my first bite and I wished I had got one to myself! The bread is soft and pillowy and almost mochi-esque which provides a great contrast to the falafel which is herby and crunchy. The salad provides an element of freshness and is comprised of thinly sliced cabbage, cucumber and tomato. The aubergine is silly and smooth and in bite sized pieces to make it easier to eat. And last, but certainly not least, the lashings of tahini dressing which is cool and slightly bitter. So, onto the technical stuff. It costs €6,50 and is definitely big enough for a meal for one. It’s filled with falafel and salad and will keep you full for a matter of hours (until the compulsory afternoon pastry break)! Wow, I can’t believe I’ve actually spent all morning raving about falafel when I could have been at a Parisian bakery but this is the best of the best. 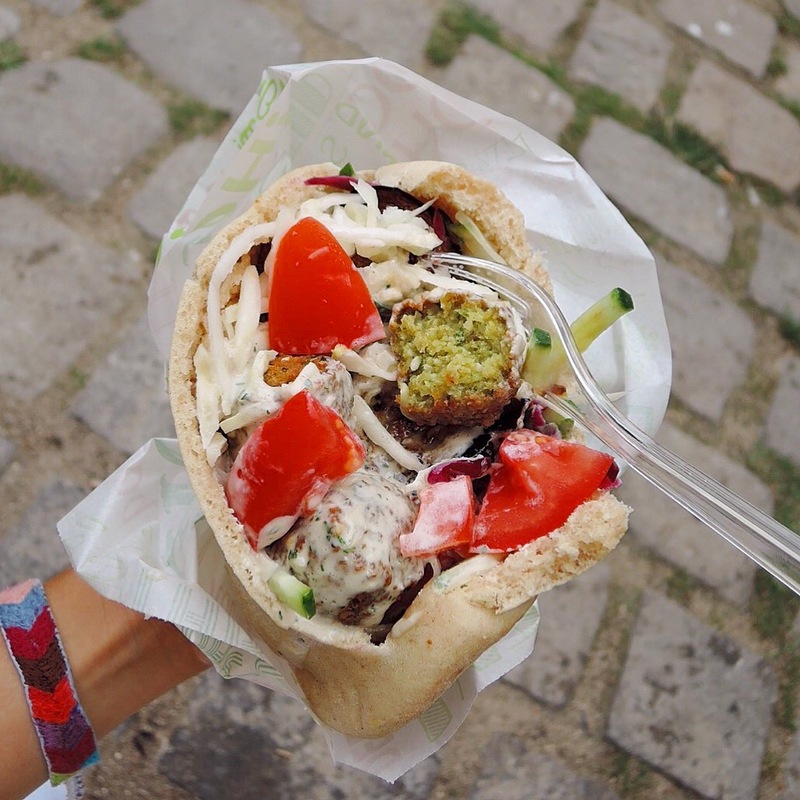 If you find yourself in Paris, you must stroll around the alleys of Marais and get yourself a falafel. You’ll never look back! Back at it with the reviews! I love sharing all my favourite spots around London with you all so I hope you enjoy this review. I started with a carrot, apple and ginger juice which was sweet and refreshing. They have so many wonderful drinks on offer and always have specials of the day (prickly pear was the special when I went). For the main, I obviously had to get a little bit of everything just to taste all the different things they had on offer. The highlight of the meal was definitely the smooth and smokey babaganoush, beetroot mint (delicious with the addition of mint) and the dried green bean salad. To be honest, it didn’t look or sound like the most appetising thing on the menu but the flavour was banging. Green beans tossed with walnuts and a tangy vinaigrette. Definitely something simple that I’ll try to recreate – I’m sure it would be great with a pesto dressing too. There were plenty of options for everyone, whether you’re gluten free, dairy free or raw. There were so many delicious dishes from fresh Asian slaw and carrot salad to mushroom pie and falafel. And of course, there’s always room for dessert! I sampled a little bit of everything but the warm sticky pudding was so decadent and delicious. They also had a range of fruit on offer as well as victoria sponge cake, rice pudding and warm berry crumble. Thinking about all of this is making my mouth water! Fluffiest pancakes I’ve ever had. Vegan or not, these were bomb. I know that Angelica Kitchen are famous for their buckwheat pancakes but they didn’t have them that day. Absolute catastrophe. Wait, let me just rewind for a second. Saturday in New York. 32 degrees celcius (actually feels like someone has put me in an oven). Walking down the streets ready for brunch and to stuff myself with pancakes. Goes into Angelica Kitchen. No aircon. Literally feels like 50 degrees hotter than outside where the sun is burning my white skin. We sit down and they bring us water. There’s no freaking ice. Lord help me before I melt into an actual puddle on the ground. But we decide to stay and eat pancakes because brunch is what I came for and I won’t leave without them! So even with the million degree heat I still loved these pancakes. 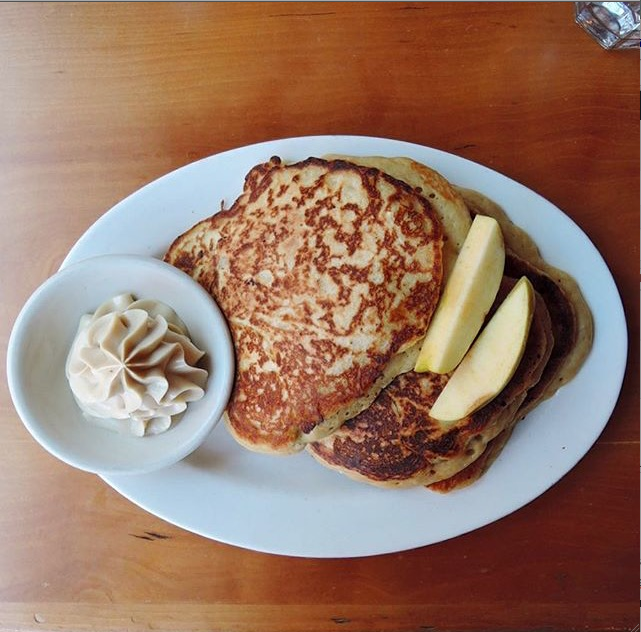 They were fluffy wholewheat pancakes (for the record, I love love love wholewheat pancakes and the nutty flavour they have) and the best part was the maple tofu whip which had the perfect amount of sweetness. Definitely a place I’ll be going back to for brunch! They also have great and reasonable lunch options, such as their dragon bowls and kale salads (ooooh yes)!